Byretech design and manufacture and a wide range of Stainless Steel Shower Curtain Rails. If you see our images elsewhere online, you know it's a Quality Byretech product. Why choose Stainless Steel for your Shower Curtain Rail ? Well, Chrome plated ones that are a little cheaper and come from the Far East. But they will quickly show rust marks and look terrible, which is why we don't sell them. If it's a quality Byretech Stainless Steel Shower Rail, it will never rust and look perfect for years ! The beauty of Byretech rails is that they can be cut to size and fitted together easily, giving you the exact size you need for your unique bathroom. Plus, we use the absolute best grade stainless steel tubing, solid stainless steel brackets and multi point fixings, so absolutely no rust, tarnishing or sagging on our rails - guaranteed. Easy to fit, zero maintenance and all of our Stainless Steel Shower Rails carry a rock solid five year guarantee. Whatever your shower rail requirement, we have the rail to suit. We can also in some cases, even custom make shower rails if you can't see exactly what you need on our site. 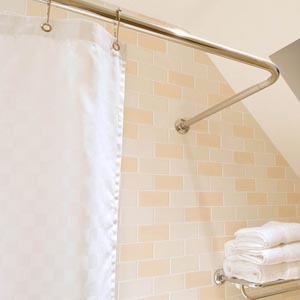 Got a question for us on our shower rails ? Just call us on 01527 522 522 and ask for Steve the Shower Rail Guru !